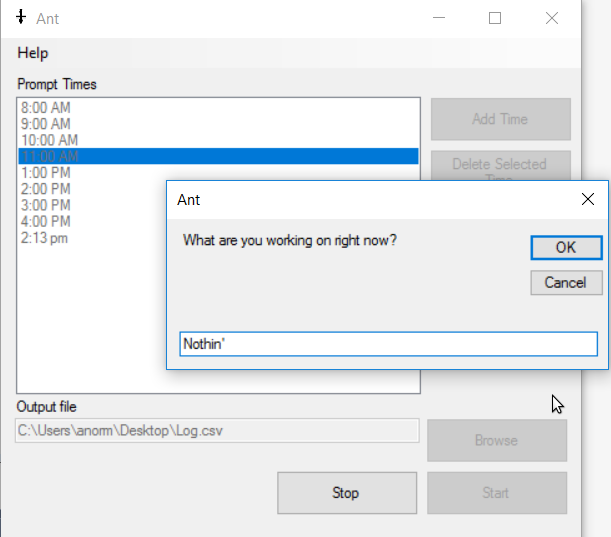 The reason I haven’t been too active in the past week or so is because I’ve been busy working on a Windows Forms project in C# called “Ant,” and version 1.0.0 is now available on GitHub. I was describing this project to my sister, and she said it would be very useful for people with billable hours. In its incarnation at that time, though, it would be kind of weird to distribute, so I decided to make it into a project that could be put into production. I did it in C# just because my experience in C# is light, so this gives me a little more exposure to the language. Initially, I was going to make this project cross-platform using Gtk#, but I wasn’t able to get Gtk# working correctly (it’s very buggy), so it’s now a strictly-Windows project using the traditional Windows Forms. This is kind of ironic since I primarily use Ubuntu. Between installing Windows 10 in a VirtualBox VM (Virtual desktops! Finally!) and learning a few things about Windows Forms that I didn’t already know from VBA in Excel, I spent quite a bit of time on this project, and there’s still some more to come. You can see the upcoming features in the Ant.todo file.